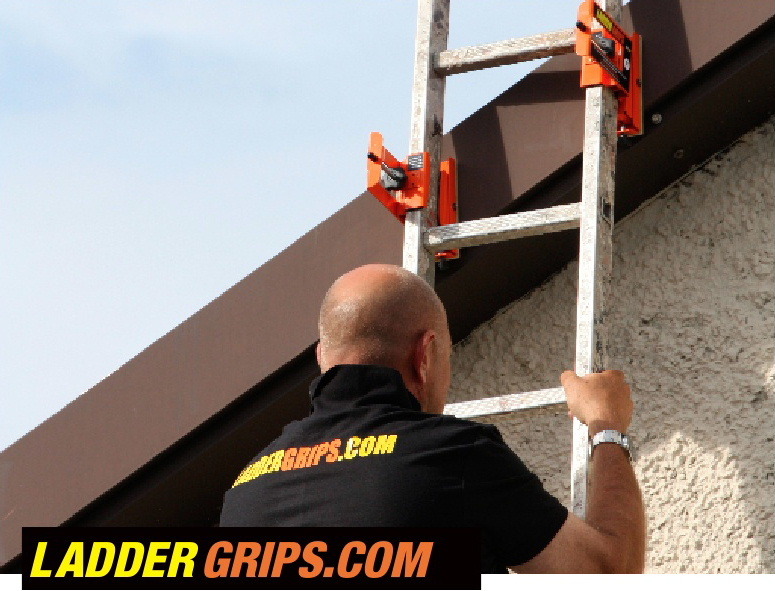 Ladder grips fit all box section ladders, Improve your ladder's stability by up to 350% with Ladder Grips! Ladder Grips are a revolutionary ladder safety accessory for the workplace and home which improve ladder stability - and thus, user safety - by up to 350%. Size for size, no other ladder safety devices or accessories provide the level of safety or versatility of Ladder Grips. 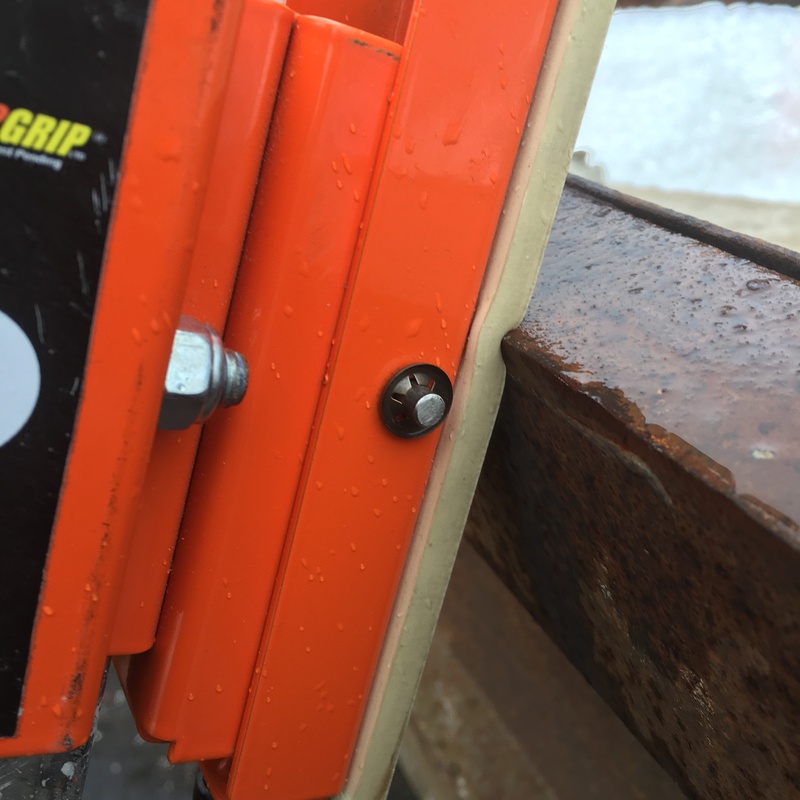 Ladder Grips are manufactured in the UK from welded 2.5mm steel with a powder coating and non-ferrous fittings to maximize strength and durability. The special natural rubber ladder pads are fixed to the steel and provide the grip necessary to keep the ladder stable. 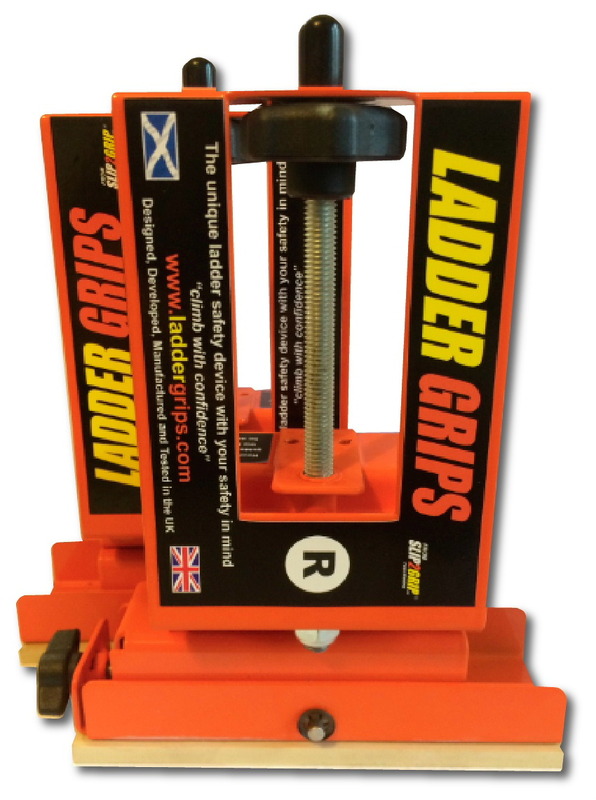 Most ladder safety devices available on the market concentrate on trying to fix the ladder feet whereas Ladder Grips secures the top of the ladder. If the top is made immobile, the feet are unlikely to move. Tests show that even where a ladder has been placed on castors or at a ridiculous angle, Ladder Grips still held it firm when climbed. Ladder Grips independently attach to the ladder stiles of all box section ladders, transforming almost any ladder into a much safer working platform. They are clamped anywhere along the ladder stiles, or legs and are secured by tightening the thumb screw. Because the grips can be independently positioned and clamped to the ladder stiles, you can work more safely on sloping surfaces such as a gable end. Staggered fitting for awkward surfaces: Normally, the poor contact of the ladder would allow even a moderate gust of wind to blow your ladder off its landing. But by off-set clamping of the Ladder Grips, your ladder maintains full and secure contact with the working surface. The 14,000mm2 of natural rubber pads can be locked parallel to the ladder stile, or pivoted, providing full contact with the surface for working angles up to 25 degrees. Gripping power for angled ascent: In another demonstration, the ladder was to set up at a sideways angle by extending one of the ladder legs. The gripping power of his Ladder Grips allowed the ladder to be climbed with confidence, even at this ridiculous angle. Ladder Grips are also small enough to pack away in your tool box once the job is done, or you can leave them on the ladder for storage. Ensuring the natural rubber pads are cleaned and dried prior to use will provide your devices with maximum gripping power. Stay secure, stay safe. Order your Ladder Grips today.